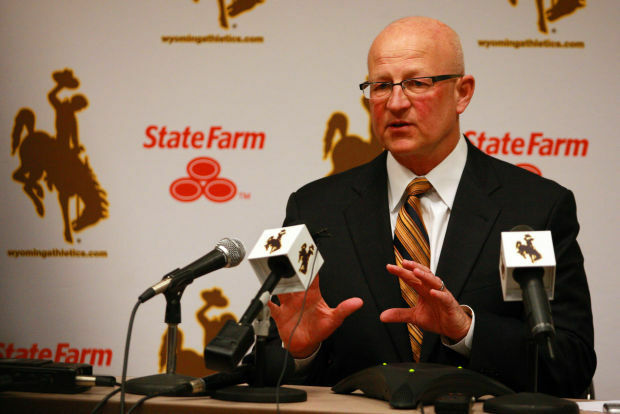 Entering his second year in Wyoming, it’s clear that Craig Bohl is electing to take the long road to building this program. Personally, I prefer that to the “get rich quick” method, so kudos to Bohl, but this will require the patience of the administration and the fanbase. Bohl is a proven winner, and given time he will win here. It just might not be in 2015. Brian Hill and Shaun Wick should make up one of the stronger running back duos in the conference. 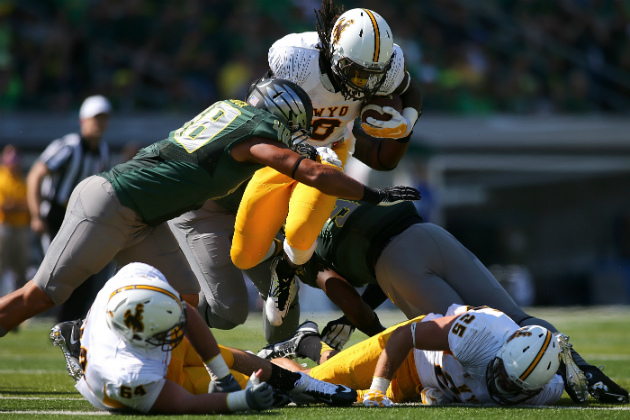 Both Hill and Wick topped 750 yards rushing and 5.5 yards per carry last season. The pair also combined for 13 rushing touchdowns and only lost one fumble. It’s also a pretty safe bet that those two guys are going to be running left early and often with the whole left side of the line remaining intact. Both the right guard and right tackle have graduated, but the left side led by guard Chase Roullier should be solid. Those three, including center Rafe Kiely and LT Ryan Cummings, are the only returning linemen with starting experience though, so it may take a few games for the right side to catch up and form a complete unit. As with many of the other Mountain West teams, Wyoming entered the spring with an open quarterback competition. Indiana transfer Cameron Coffman seems to have won that competition. Coffman was decent in his few appearances at Indiana, but was very impressive in his days at Arizona Western Community College. Coffman will also have two new starters to throw the ball to with Tanner Gentry and Jake Maulhardt stepping up for the departed Jalen Claiborne and Dominic Rufran. It will help to have Jake Hollister return at tight end, and both backs, Wick and Hill, have shown potential catching the ball out of the backfield. Gentry and Maulhardt aren’t entirely new either as both had reasonable playing time in backup roles last season. Eddie Yarbrough is one of the lone bright spots returning for this defense in 2015. A lack of speed and athleticism really hurt this defense last year, and it threatens to do so again. 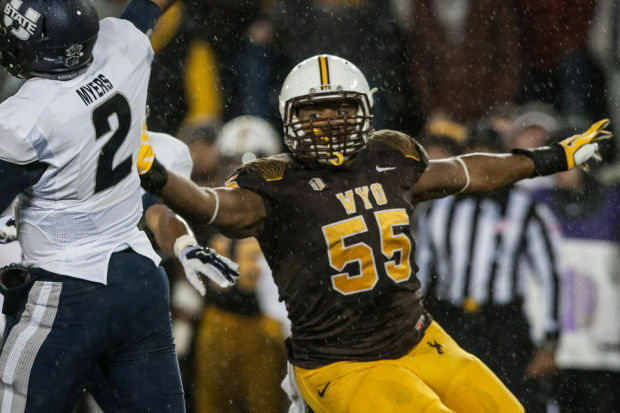 At defensive end, Yarbrough is one of the few players to whom that doesn’t apply. Yarborough’s ten and a half tackles for loss and four sacks easily led the team last season, and there’s no reason why he won’t lead the team in both categories again this season. Behind Yarbrough though, there are serious concerns, especially in the depth department. Only two linebackers return who saw action in every game last year, and only one more who saw any game time. Lucas Wacha and Will Tutein are the most experienced linebackers and they will have the task of bringing the others up to game speed, as well as being useful players themselves. Tim Kamana is also moving from free safety, where he started last season, to strongside linebacker. The secondary doesn’t offer much in the way of experience either. As a matter of fact, the final spring depth chart Craig Bohl released has four redshirt freshmen filling out the defensive backfield. A guy to really watch out of that group is strong safety Chavez Pownell, Jr. Pownell was a solid recruit coming out of high school in Tampa, Florida and really impressed the coaches this spring, earning the starting job in the process. Once again, Craig Bohl is playing the long game and in my opinion it’s absolutely the right call, but that probably won’t provide much gratification in 2015. The Cowboys start the year off with back-to-back home games against North Dakota and Eastern Michigan providing a great opportunity to start 2-0. After that, the schedule stiffens up a bit with the other two non-conference games being trips to Washington State and Appalachian State, a Sun Belt favorite. Two other home games, New Mexico and the season finale against UNLV, provide good opportunities for wins, but other than that any wins will require the Cowboys to play their absolute best ball.